You may be wondering, what is a watershed and do I even live in one? The answer is, of course, you do! A watershed is simply an area of land where all the streams and rainfall drain into a common outlet, such as a stream or river. Watersheds can be big or small, and smaller watersheds can be nested within larger ones. For example, Willistown Conservation Trust’s office is located in the Ridley Watershed, the rain that falls here will eventually drain into Ridley Creek. 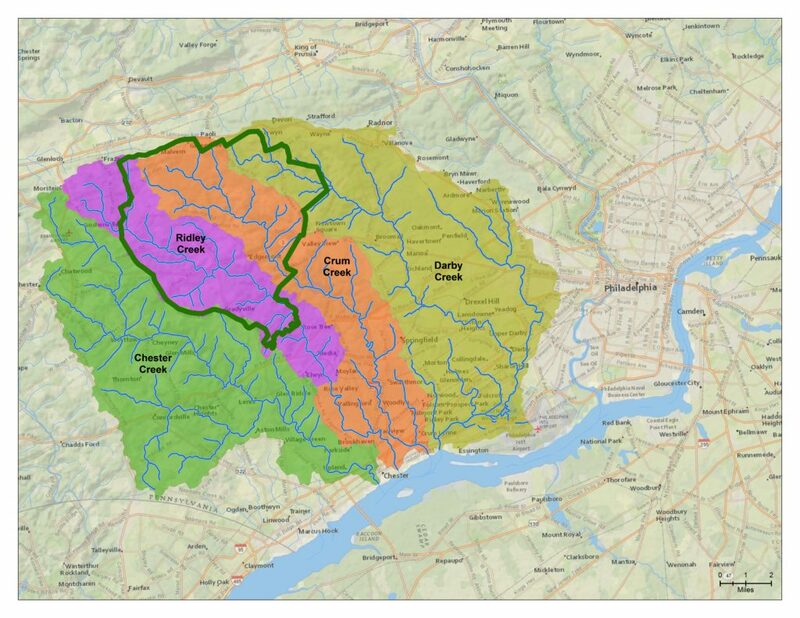 However, Ridley Creek flows into the Delaware River and therefore the Ridley watershed is nested within the much larger Delaware River watershed, which in its entirety extends across 4 states. All of Willistown’s creeks are tributaries to the Delaware River, which flows all the way to the Atlantic Ocean. While it may seem like Willistown is a long way from the ocean, the interconnectedness of waterways means that any pollution here, from fertilizers to sediment to road salt, is reflected downstream. The Trust’s focus area is fortuitously located in the headwaters of the Ridley, Crum, and Darby creeks – that is, these three streams, born of springs from the groundwater below, begin right here. We have a responsibility, as the most upstream community, to give our freshwater its best start before its long journey to the ocean. The Watershed Protection Program is actively restoring and monitoring water quality here in the headwaters of the Ridley, Crum, and Darby creeks. Our goal, through restoration and best management practices, is to make sure that our lasting impact is a positive one for our downstream neighbors.